This simple dessert perfectly preserves the flavor of fresh strawberries, and although it requires several hours freezing time, it takes only a few minutes of actual work. 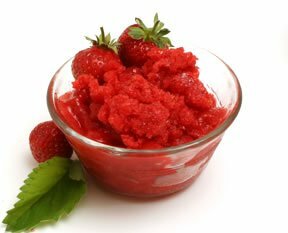 Strawberry Granita is a sweet and delicious icy treat that will help you beat the summer heat. See how easy it is to make this refreshing summer treat. Made from fresh oranges, this recipe not only will keep you cool but it will also provide you with a dose of vitamin C.
We can show you how to make this healthy summer slush that you can feel good about serving to your kids on these hot summer afternoons.